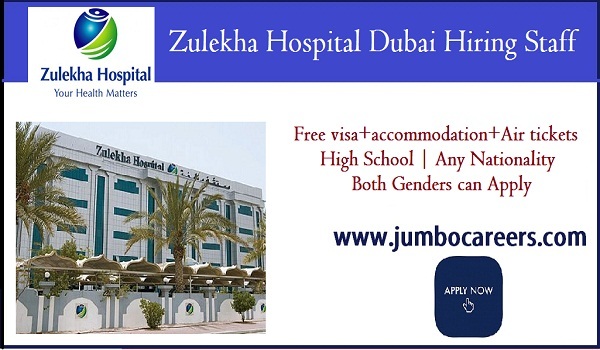 Zulekha Hospital Dubai hiring experienced staff including Staff Nurses, Doctors and medical technicians. Attractive salary, excellent benefits including visa, accommodation, paid annual leave, flight tickets and training provided. About the Company : The Zulekha Healthcare Group found its roots in 1964 when its creator Dr. Zulekha Daud moved from her native India to Sharjah, UAE in order to pursue her dream of serving people in need and offer affordable medical facilities to all.From a young medical graduate to a practicing physician serving patients from all walks of life, Dr. Zulekha soon became a household name. After years of dedicated service, Zulekha Hospital was first established in Sharjah in 1992.